Spanish boat MAPFRE (Iker Martínez/ESP) won their second Volvo Ocean Race in-port race running on Saturday, but only with two metres to spare after a thrilling contest in the Portuguese sun (full story below). MAPFRE won her second Volvo Ocean Race in-port race today, but only with two metres to spare, skipper Iker Martínez edging the Spanish VO65 past Abu Dhabi Ocean Racing as the boats simultaneously gybed on the finish line to finish just one second ahead. At one stage, it looked as if MAPFRE had infringed Abu Dhabi Ocean Racing, but the judges deemed that Martínez had judged the final manouevre to perfection. The win moves MAPFRE back to having an outside chance of a podium finish in the series after winning their previous in-port race victory in Newport, Rhode Island, last month. Meanwhile Abu Dhabi Ocean Racing skipper Ian Walker will still be pleased as his crew’s second place now leaves them clear in the overall in-port race standings, with two more races to go. The UAE boat's closest rival, Team Brunel, struggled for much of the course, which was cut from six to five legs by the Race Committee, due to decreasing winds on Lisbon's heavily tidal Tagus River. Throughout the race MAPFRE appeared to be in control, pulling out a lead of 400m at the third mark. But just when it appeared to be a done deal, Abu Dhabi Ocean Racing stormed back in stronger wind on the fourth leg and briefly snatched the lead from them. 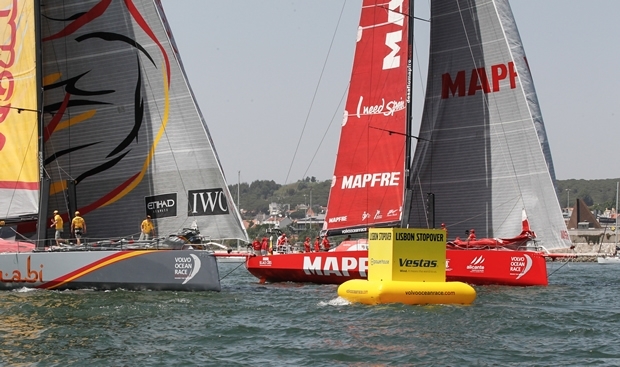 It was only at the finish line that MAPFRE manage to once again slip ahead to take the gun. Team Alvimedica, which, pre-race, had trained in nearby Cascais, used its team's local knowledge to post a solid third-place finish. But immediately astern Team SCA and Team Vestas Wind performed a near copy of the leaders' photo finish, both approaching the line within metres of each other. However Team Vestas Wind snagged the finish mark and was forced to complete a turn, allowing not only Team SCA but Team Brunel and Dongfeng Race Team to cross ahead of them, leaving them trailing in the seventh and last position. Vestas Wind crewman Nicolai Sehested was left stranded on the mark as he tried to free the boat. Team SCA did well to salvage a fourth place having been OCS and forced to turn back to restart properly against the tide. The 647 mile penultimate leg departs Lisbon on Sunday at 1300 UTC to Lorient. Abu Dhabi Ocean Racing begins with a six-point overall advantage over both Team Brunel and Dongfeng Race Team.